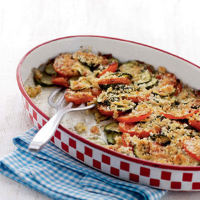 Arrange the courgette and tomato slices in a single layer in a large, 2 litre, ovenproof gratin dish; season to taste. Mix together the breadcrumbs, cheese, garlic and cayenne pepper and sprinkle over the top. Drizzle with the olive oil. Bake in the oven for 30 minutes until the top is golden and the vegetables are tender. Serve with crusty bread. Add any leftover pesto to pasta dishes, or mix with breadcrumbs and use as a topping for baked fish. fresh. Profits from our new Waitrose Foundation wines go towards social and environmental projects on the maker’s wine farm in South Africa: Cederberg Waitrose Foundation Chenin Blanc, South Africa.